Chalet Le Pavot offers its guests a wonderful opportunity to take their winter or summer break in a pretty and traditional alpine village situated in a beautiful tree lined valley yet still have immediate access to one of the world's best and famous ski areas – Espace Killy. Very rare in the Espace Killy ski area it represents a chance to rent an independent standalone self catered Chalet that can accommodate two or possibly three families. Chalet Le Pavot is a traditional but modern alpine chalet nestled in the south facing hills above the pretty and tranquil village of Tignes Les Brevières. The views from the Chalet across the village over the river to the ski slopes beyond are stunning in both winter and summer alike. Conveniently located just 4 minutes walk from the shops and restaurants living is easy at Chalet Le Pavot whether you intend to eat in or spend a pleasant evening in one of Les Brevières’ excellent restaurants. My wife and I are independent owners and Chalet Le Pavot is the only property we own apart from our house near Emsworth Hampshire in England. During the winter we like to ski and in the summer it's horse riding and sailing. I'm now retired so I spend quite a bit of time at my Chalet but also rent it during peak holiday periods. My wife and I spent a great deal of time and effort preparing our chalet, we are delighted with the decor and furnishings and seek to maintain them to a high standard. I had been taking Ski holidays in Tignes for about 12 years and found that the quality of the skiing and sheer size of the Espace Killy beats all other resorts I've been to. Summer in Tignes is also great with summer skiing as well as all of the other activities available. I purchased my Chalet in April 2008 after deciding that when I have more time I will probably live there several months of the year. I chose Les Brévières because it is probably the prettiest village that has direct access to Espace Killy ski area. The thing I like most about my chalet is that it is independent with its own driveway and parking up a quiet lane yet it's still close to the local shops and ski lifts, you can get to them easily by foot. The views from the property are absolutely stunning. I really enjoy using the games room and relaxing in the Sauna. 1st floor Family bathroom with Bath, shower, basin, separate wc room. Shower room on ground floor with basin and separate wc room. Two shower rooms adjacent to boot room. Under Floor electrical heating with fitted radiators for extra boost if needed. Wifi available password will be provided before arrival. Large room of more than 35 square meters. Dining table and chairs two triple sofas, one double sofa, poufs and bean bags. TV, DVD, Stereo (CDs) patio doors open onto covered patio. Beautiful fitted kitchen. (see photos) Electric oven and hob, Fridge freezer, microwave, toaster, electric kettle, coffee machine, cutlery and dinner service for 15. Dining area adjoins lounge area. Small library in chest of draws in dining area. Some family games kept in main lounge area. Pool table football and child friendly darts in games room plus TV which can be used to play video games of your own. The highest golf course in Europe can be found in Tignes Le Lac less than 15 minutes from the Chalet. This is a full 18 hole course set close to the lake amongst magnificent surroundings with the mountains rising from each side of the course. 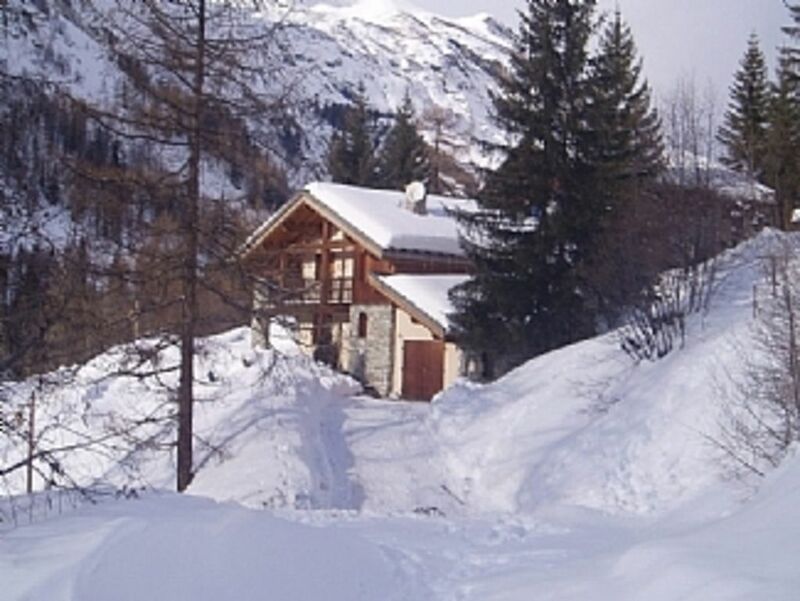 Notes on accommodation: The Chalet has underfloor heating so is very snug and warm in winter. The floors remain cool in summer keeping the temprature of the chalet cool. The Chalet also has a very nice Sauna. Outside: The house has patios facing to the sount and west. Some of the Paito area is covered and shaded. Utility Room: Heated boot rack, ski racks, washing machine and hanging areas for wet ski gear. Seperate entrance to chalet for bootroom with rubber matting leading to boot room. Cleaning / Towels / Linen / Maid service: Towels and Linen are provided weekly. The property is cleaned weekly on change over day. Property can be cleaned more frequently at additional cost. Other: Games room with pool, table football and child freindly darts. Sauna room with 2 shower cubicles. Das Chalet gefiel uns sehr gut! Der Vermieter war sehr kooperativ und verständnisvoll in allen Anliegen. Das Chalet liegt in einem sehr schönen Ort. Mit 15 Leuten ist der Platz in den Zimmern etwas knapp dafür hat das Chalet aber genug andere große Räume! Gerne besuchen wir mit unserer Gruppe das Chalet erneut. Wir waren mit einer Gruppe von 15 Erwachsenen vor Ort. Tignes can be reached easily from three airport: Geneva and Lyon are both 2.5 hours by road and Chambery 1.25 hours by road. There are excellent rails links from Lyon to Bourg St Maurice where you can take a Taxi (20 minutes) or coach to Les Brevieres. The famous "Snow Train" operates between London and Bourg St Maurice. From the channel tunnel or ferry ports you head south on the A26 to Lyon and head west along the A46, A43 and A430 then through Albertville, Moutiers and Bourg St Maurice. 300m to local bars and resturants. Booking Notes: Please go to the owners website (see link below). Changeover Day: Changeover day is either Saturday or Sunday depending upon what is agreed with the Landlord. The Chalet will be ready for occupation at 16:00 hours. On departure day the Chalet must be vacated at 10:00. Notes on prices: Bookings may only be made for full weeks during peak and mid season. Please contact Landlord should you wish to book less than 7 nights during an off peak period. Short break bookings are subject to availability during low season (please email via owners web site for details).